Answer songs fall into two camps for me – awful or excellent. Often they simply reprise the original with no effort made to take the song concept any further, but when they do the results can be really successful as you hear the original subliminally giving you two tracks for the playing time of one. 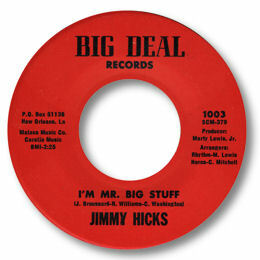 I’m Mr Big Stuff is one of my favourite answer songs, not just because Jean Knight’s smash was so well made and is one of those cuts you can never tire of, but also because Jimmy Hicks, and particularly the arranger and producer Marty Lewis, has added to it so subtly. The guitar figure here is completely insidious, and the organ part is deftly different. The horns could be further up the mix but that is carping. Southern funk the Big Easy way – feel good music to lift the spirits.